Protesters walk north on the Dan Ryan Expressway after blocking transportation in an anti-violence march. In addition to protesters from Chicago, at least 36 Evanston residents joined the shutdown in solidarity. Evanston residents joined protesters from across Chicago in blocking the Dan Ryan Expressway Saturday to call attention to gun violence, crime and other issues affecting neighborhoods in the city. Thousands of people gathered on the highway for a shutdown of the northbound lanes, led by Rev. Michael Pfleger of St. Sabina Catholic Church in Chicago. Pfleger called for common-sense gun reform and peace across neighborhoods in the city. At least 36 Evanston residents attended the shutdown, taking buses down to the city organized by students from Evanston Township High School. Liana Wallace, a rising senior at ETHS who helped organize the buses, said she worked closely with Ke’Shon Newman — a high school student from Chicago — and other students to coordinate their support of the shutdown. She said that as the shutdown ended, she and other protesters made sure to shake the hands of officers who were present at the scene, hoping to keep the dialogue open between two groups often at odds. Wallace said she wants to emphasize holding people accountable — especially politicians — and hopes that the protest can act as a catalyst for continued dialogue and action on the issue of gun violence. Newman, a member of the B.R.A.V.E. Youth Leaders of St. Sabina, said the shutdown was planned strategically to interrupt traffic and coincide with the 4th of July holiday. He said he appreciated the support from protesters across the city and surrounding areas, and that the solidarity between people from different backgrounds emphasized that everyone was “fighting for the same problems we’re facing in our daily lives. According to the Chicago Tribune, Pfleger said for weeks that his intention was to shut down the expressway for a demonstration which was set to focus a spotlight on crime, joblessness and poverty plaguing neighborhoods throughout the city. Chicago police urged him to use a neighborhood street instead of the interstate, the Tribune reported, while Illinois State Police threatened arrests. Protesters became stalled near 76th Street for about an hour, according to ABC 7 News. 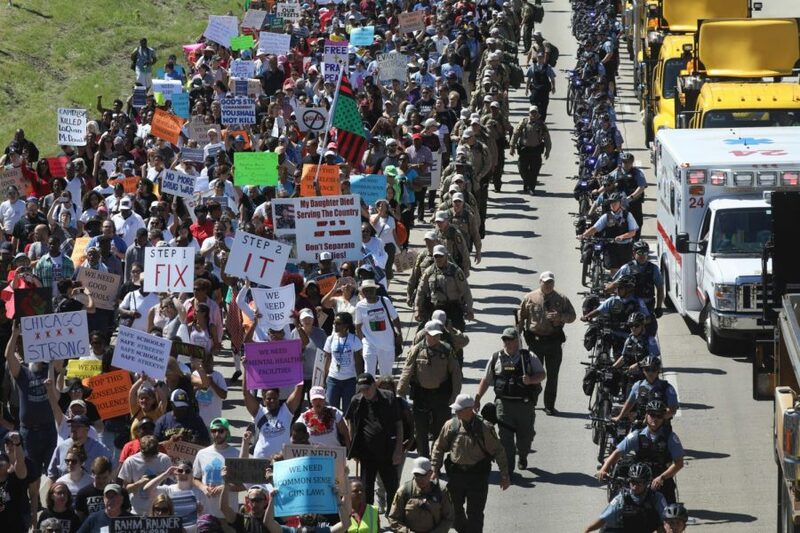 Officers with the Illinois State Police, Chicago Police Department and the Illinois Department of Transportation initially stopped protesters from blocking the two left lanes to keep them open for traffic, but the demonstration was eventually allowed to continue to the northbound lanes. Nina Kavin, a founder of Dear Evanston, a multi-platform social media campaign which seeks to shed light on violence across the city, said attending the shutdown was a motivating experience. She said she was inspired by the wide range of ages and backgrounds of the protesters, and felt there was solidarity among the attendees.